The EWA Aerobic Fermenter is a discontinuously working device intended for the processing of biodegradable waste. It is designed to process a wide range of biodegradable waste, including gastrowaste, waste from the digestive tract of animals for slaughter and dewatered sludge. 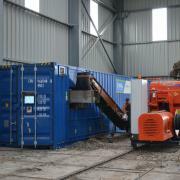 Processing takes place in a closed non-outflow space (container) with a volume of 36 m3. The uniqueness of EWA consists in its ability to perform the digging up of filling inside the fermenter. Together with a special system of filling aeration throughout its volume and thermal insulation of the workspace by means of mineral wool, it enables the perfect oxygenation of filling and temperature homogenization. The fermenter workspace and all its parts are made of stainless steel. For fermentation initiation, no auxiliary agents or preparations are used. The EWA Aerobic Fermenter is an easily portable device equipped with a control computer for automatic operation control. Its delivery includes a formula developed for specific user conditions. To deal with non-standard events and servicing activities, a permanent Internet connection of the device is utilized, which enables the remote preview of the fermenter control system.